FILE - Kosovo's President Hashim Thaci is seen during a round-table meeting at the EU-Western Balkans Summit in Sofia, Bulgaria, May 17, 2018. Kosovo President Hashim Thaci says defining the borders between Kosovo and Serbia is a key step toward easing tensions between the two nations. Border talks come 10 years after Kosovo declared independence from Serbia. Kosovo has been recognized by more than 110 countries as a sovereign nation, though Serbia refuses to recognize it. Both countries want to join the European Union, but Brussels said disagreements over Kosovo's sovereignty must be settled first. "One thing should be clear: Without defining the borders, there cannot be a final, peaceful agreement that would guarantee mutual recognition [between Kosovo and Serbia]," Thaci said in an interview with VOA's Albanian Service. He added that teams from Kosovo and Serbia, as well as representatives from the United States, NATO and the European Union, will work together to "clearly define the border between Kosovo and Serbia." His comments follow meetings in Washington with National Security Adviser John Bolton and Secretary of State Mike Pompeo. Pompeo "encouraged Kosovo to seize this unique window of opportunity to reach a historic comprehensive normalization deal with Serbia." Bolton tweeted that "the U.S. stands ready to help both parties achieve this historic goal." Thaci did not elaborate on what has changed to allow progress after 10 years of tension and apparent stalemate. FILE - People protest against Kosovo President Hashim Thaci's border change proposal deal with Serbia in Pristina, Kosovo, Sept. 29, 2018. Neither Bolton's nor Pompeo's statements mention border changes, although in August, Bolton was the first senior U.S. official to say that Washington would contemplate the idea if the parties agree to it. "Our policy, the U.S. policy, is that if the two parties can work it out between themselves and reach agreement, we don't exclude territorial adjustments. It's really not for us to say. It's obviously a difficult issue. If it weren't, it would have been resolved a long time ago. But we would not stand in the way, and I don't think anybody in Europe would stand in the way if the two parties to the dispute reached a mutual and satisfactory settlement?" he said back then. Bolton's comments came after Thaci and his Serbian counterpart, Aleksandar Vucic, floated the idea that could see Serbia getting parts of northern Kosovo with a mostly Serb population, and Kosovo getting parts of Serbia's Presevo Valley, inhabited mostly by ethnic Albanians. But neither leader explicitly addressed where the border would be redrawn and have not — at least publicly — put forth a detailed plan. The idea has sparked fierce opposition within their countries. Thaci said Wednesday that there cannot be mutual recognition without defining borders. 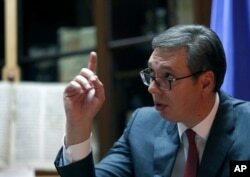 "Everything will have to go through Kosovo's parliament, whether it is approved or not. Or the other alternative is a referendum. But it is easy to be a skeptic. It is more difficult to take responsibility and do the work. That is why, invite everyone to act together, take responsibility, discuss. We can all agree to it, or we don't. But if we don't, we all together pay a price," Thaci told VOA. Vucic has rarely spoken about redrawing borders but recently complained that the idea seems to have little support in Serbia. Western experts have warned that changing borders in the Balkans could destabilize the region. FILE - Serbian President Aleksandar Vucic speaks and gestures during an interview to The Associated Press, in Belgrade, Serbia, Oct. 13, 2017. Flare-ups are common between the two countries. A tariff scuffle is the latest example. A week ago, Kosovo's government imposed a tariff of 100 percent on imports of Serbian goods. It was retaliation for Belgrade's efforts to block Kosovo's membership in international organizations. Tariffs were imposed a day after Kosovo failed to become a member of Interpol, widely seen as a result of Serbia's strong lobbying effort to prevent it. After meeting Thaci on Monday, Secretary of State Mike Pompeo urged Kosovo to "rescind the tariffs placed on imports from Serbia and Bosnia and Herzegovina, and to work with Serbia to avoid provocations and de-escalate tensions." Washington seems to be pushing the two countries to normalize their relations. Efforts to reach that goal will test both nations' leaders and show how high a price Kosovo and Serbia are willing to pay to trade their troubled past for a more prosperous European future.